The Best-Vet is a FDA-registered microcurrent therapy device. The handheld device implements Avazzia, Inc.’s BEST technology, which stands for Biofeedback Electro Stimulation Technology. Biofeedback can be defined as the body’s (“bio”) response (“feedback”) to electrical stimulation, and the device’s ability to recognize and communicate with the body. This interactivity makes the Best-Vet a unique microcurrent therapy device. Learn more about BEST technology and see Best-Vet Treatment Photos. BEST devices outshine all other microcurrent therapy units on the market, likening them to the distinction between smartphones and regular cell phones. The BEST devices provide a unique combination of features – handheld and highly portable, a variety of treatment methods, and an interactive biofeedback feature. The BEST devices recognize deficient tissue and correct it. Unlike other types of units that require the user to adjust settings, the BEST devices automatically adjust treatment based on the issues found. A small amount of training is required with the purchase of the Best-Vet to learn how to properly treat your horse. Then biofeedback alerts enable anyone to locate a horse’s problems, treat them, and know if the horse’s issue has been resolved. Traditional microcurrent units are barely felt, allowing easy crossover between treating people and animals. However, when choosing a BEST device it is critical to remember that human units are not transferable to animals. The biofeedback and tissue resistance features of the BEST devices create stronger sensations than most other microcurrent units. This breakthrough in the tissue is more easily felt, but means results are three times faster than traditional microcurrent therapy applications. The BEST veterinary devices’ lower output sensations accommodate animals’ heightened sensitivity. The human units still have higher outputs, which animals will not tolerate. Another variation when treating animals with the BEST therapy devices is the necessity of water and an accessory electrode, whereas on people the back plate can be used and treatments are dry. 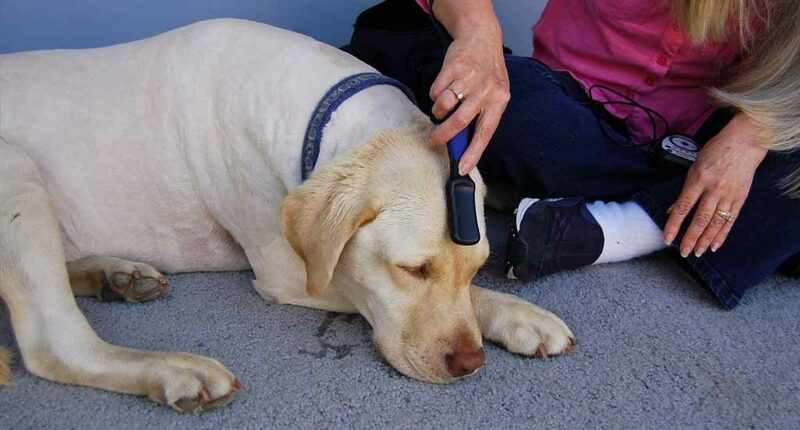 When the comb electrode is placed on the animal, the Best-Vet therapy device sends microcurrent signals through the skin. During this process the Best-Vet gathers data – such as hydration, lack of cellular voltage, and resistance – and reacts to this information by adjusting the treatment. As the Best-Vet is applied, the electrical properties of the tissues change. The device detects the change and responds, resulting in the very next signal being modified. On horses and short-haired dogs, the Best-Vet is most commonly used with the electrode comb. Other options include connecting the Best-Vet to pads, rollers, and acupoint pen probes. Along with taking readings to locate problem areas on your horse, dog, or other animal, the Best-Vet can be used in the same manner as other microcurrent units. Attached to a surcingle and using splitters and extension wires, it is possible to perform any of the treatment setups found in MicroCurrent for Horses. The Best-Vet therapy device can also be clipped to your waist and then used with silver knit glove electrodes, or a roller and a glove, or any combination of electrodes. Matrix now offers the ability to create your own Best-Vet kit, adding accessories in one easy step to customize your Best-Vet kit to suit your needs (see Treatment Photos). In general, the Best-Vet can be very useful to maintain or determine problematic and painful areas in our horses, dogs, and other animals, along with resolving the problem. The great part about using the Best-Vet is that while locating the issue you have also started the process to recovery. The device automatically gathers information and redirects correct signaling. The body takes this information and uses it as a kick-start to start the repair process. Working performance horses and dogs get sore in their necks, hips, backs, hocks, feet, and legs. In other words, just about anywhere can get sore and it can be extremely frustrating finding the exact location of discomfort. The Best-Vet enables you to locate sore areas in just a few minutes by going over your horse or dog with it the comb electrode. Use the Best-Vet to go over the suspected lameness areas, then continue looking throughout the horse’s body for compensating injuries or the root cause of the injury. This information can be a starting point for further tests or additional confirmation when working with your veterinarian. Check out the products pages to find the right tools for your therapy toolbox! Copyright © 2011, Matrix Therapy Products Corp. All rights reserved. Reproduction in whole or in part without written permission is prohibited.